Check out my new YouTube video about how to construct a bead embroidery project. It covers the basic materials: beading surface, backing, reinforcement and findings. I hope you find this helpful, especially you beginners out there. Full Screen icons at the bottom of the video screen. Here's some exciting teaching news! Early next week, on Tuesday, November 25, I'll be presenting a webinar for Interweave Press on my favorite bead embroidery tips and tricks! We start at 11:00 a.m. my time (Mountain) and 1:00 p.m. EST. ...but KEEP READING to get some top secret info (shhh!) down below, just for the readers of my foolish bloggishness. 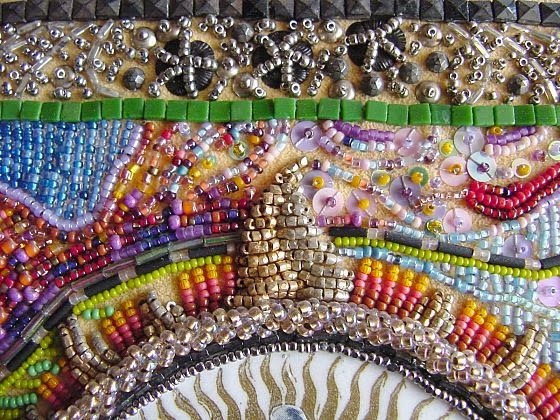 Bead Embroidery: Techniques and Inspiration from Mary Tafoya -- Register here, or purchase the download (If you attend the live webinar, you also get the download! Plus you get to ask questions during the webinar.) Also a nice long description of everything we'll cover. Meet ... Mary Tafoya (a quick interview at Beading Daily) Read this and decide. Ha! First, I'll show you a couple of basic bead embroidery stitches you can use to create just about any design you want. Then, when the shock wears off at how simple they are, we'll move on to some basic materials and how to stack them. Next, I get to brainwash inundate persuade blather show you some examples of things like how to get your lines really straight, or not! And, what circles look like. No, seriously, you'll get to see super closeups of various techniques with lines, including layering them for a bit of dimension. The real meat and potatoes of the webinar (or beans and rice if you're vegan) are probably the sections on dimensional effects and working with found objects. I think everyone will like them, but especially the experienced beaders. I hope! Finally, I'll show you some of my fancy finishing techniques, and explain how I constructed a wall hanging. Once I've talked your ear off, it will (finally) be time for you to ask questions! The great folks at Interweave will make sure that No Question Goes Unanswered. If we don't get to you, we'll collect your Q's and send everyone the A's after the session. Again, if you attend the live webinar, you also get the download. Hope to see you in virtual beadland next Tuesday! 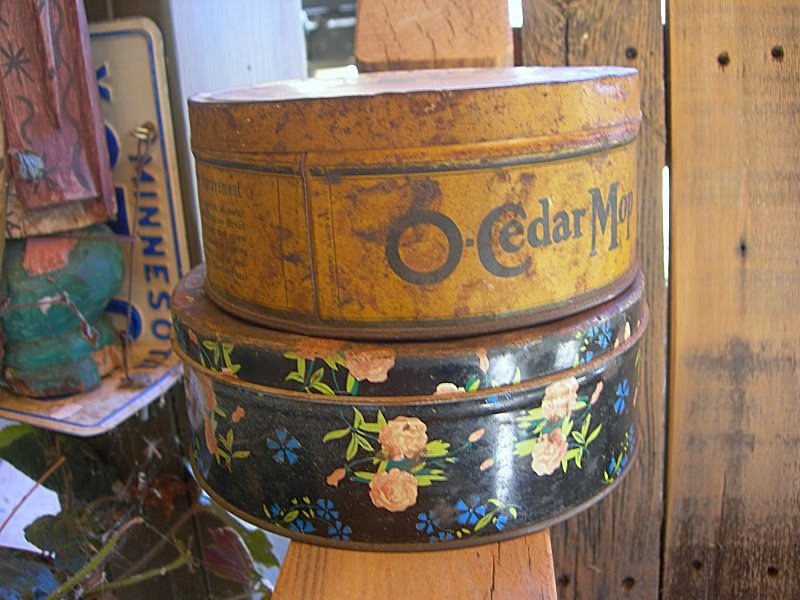 These two old tins were given to us by two different friends. 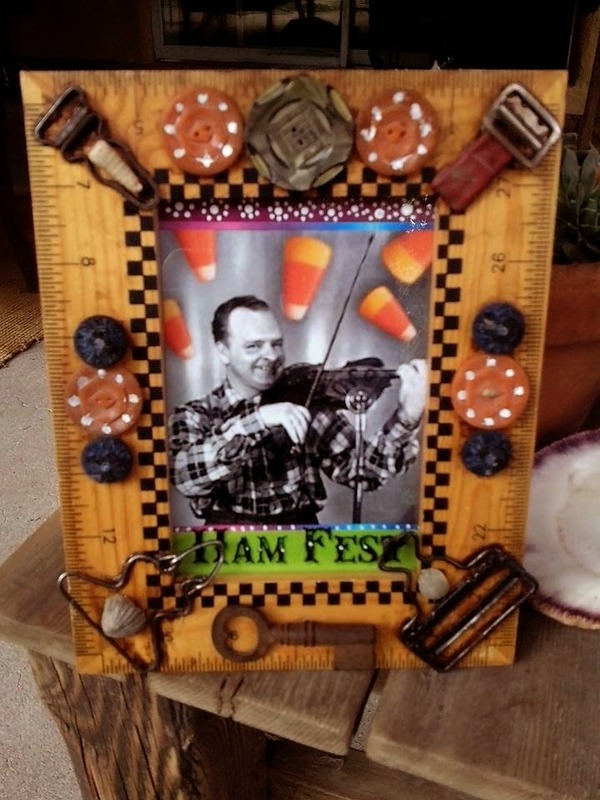 My fictional fiddlin' forebear, Otis Ham Waddle! buttons, buckles, and fossils all the way from Ohio. 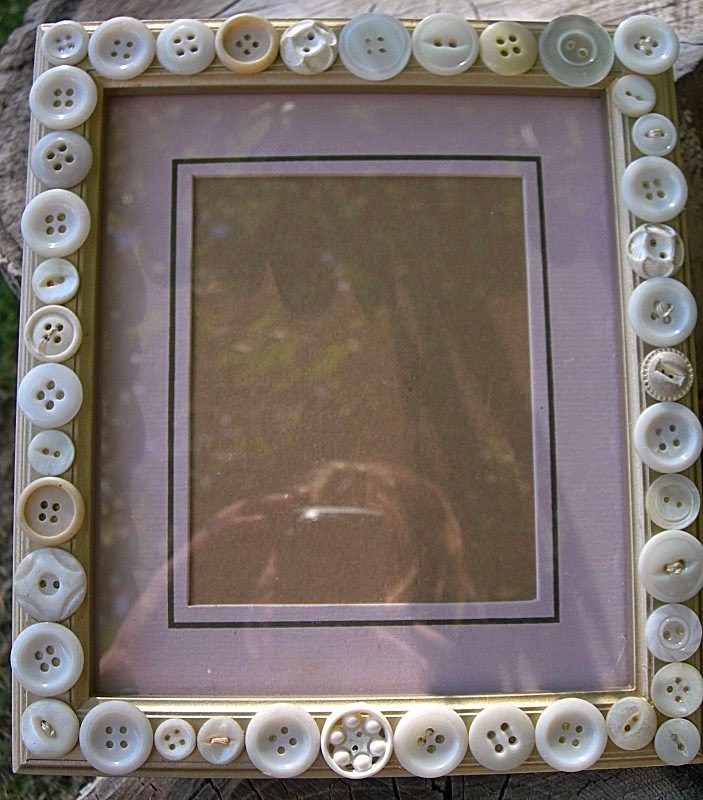 decorated simply with shell buttons from the flowered button tin. I'll leave it to my friend to add a photo of her own. Brilliant Idea No. 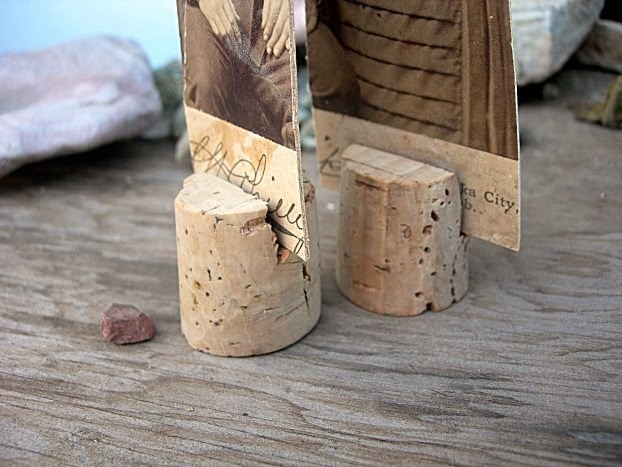 .0002 -- Cork Stands! Click the image for a closeup! So here you go. Find a big cork and set it on the table, wide end down. Saw through the center of the narrow end, back and forth, using a sharp knife or craft blade (Kids, ask a parent. Knives are sharp). Squeeze the sides together to stabilize the cork and saw gently. Cut a slit about halfway down the cork. And voila! 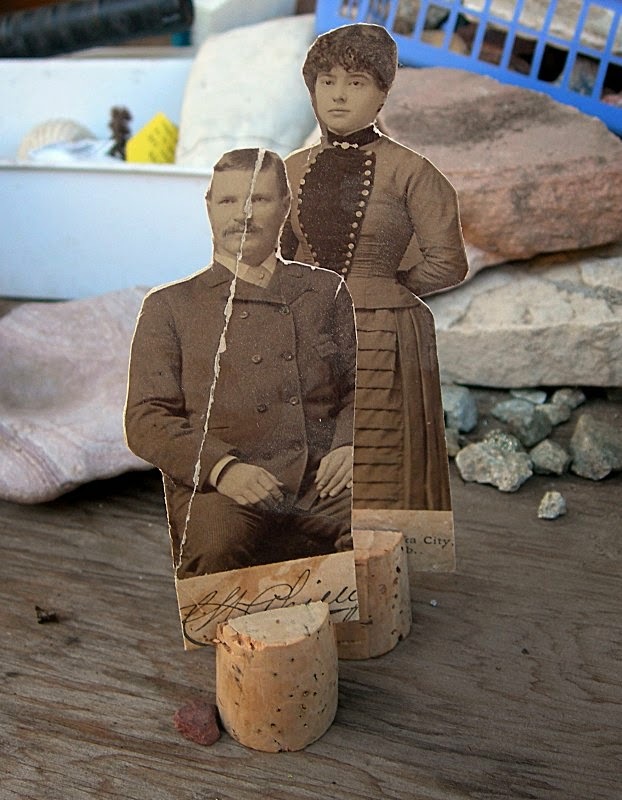 Slip in the cabinet photo (or other creation), and it stands up just right.